Koi CBD is a California-based company that manufactures CBD products made from a hemp plant. It is 100% natural, ISO certified and contains no THC. Purity, consistency, and safety of their products are backed up with their lab results, which provides full traceability from the start to the finish product. 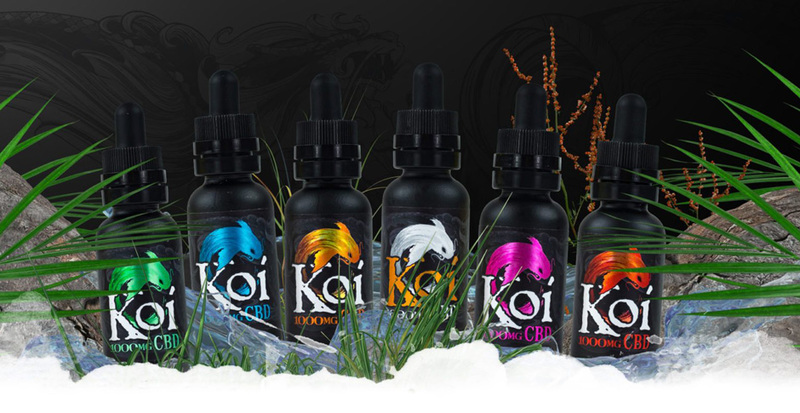 Unlike other CBD oils, Koi CBD oil offers six pre-mixed e-liquids that offers vaping right from the bottle. We tested four different flavors to see if Koi CBD does improve vaping experience. We have tried Jade Koi CBD (Watermelon Green Apple Sour), Blue Koi CBD (Blue Raspberry Dragonfruit), Gold Koi CBD (Vanilla Caramel Custard) and Red Koi CBD (Classic Strawberry Milkshake). Our favorite, no doubt, is the Blue Koi. Blue Koi CBD is fruity yet mild tasting. The raspberry is more dominating than the dragonfruit. Nevertheless, it was an amazing blend! To be honest, it’s like tasting a gummy bear that melts in our mouths. No strong aftertaste, thank goodness. Jade Koi is also good too. The flavor was strong yet it didn’t decrease as we continue vaping. A strong punch was delivered every time. We can’t get enough of this one too. However, Gold and Red Koi are bit disappointing. They have only a hint of described flavors. Also, the chemical taste is kinda strong. They are not totally unvapeable but the aftertaste didn’t do it for us. For a 30mL bottle, their prices are pretty reasonable. It ranges from $29.99 to $99.99. A bottle with 100mg CBD concentration costs $29.99, $39.99 for 250mg, $59.99 for 500mg and $99.99 for 1000mg CBD. A brand new line called Koi Naturals will be soon be available (at the time of this writing). It is an all-new bare essentials with full-spectrum blend and coconut oil. It comes in three strengths: 750mg, 1500mg and 3000mg. Price starts at $79.99. Koi CBD also offers a bundle deal. Five 30mL bottles with different flavors in the price of four bottles. Prices ranges from $159.96 to $399.96. We also found this coupon for $5 off Koi CBD. Visit koicbd.com for the latest sales and deals. We felt the calming effects of Koi CBD around 17 to 30 minutes. There were no palpitations and it alleviate our mild headaches. Best of all, it doesn’t have the dizzying effect that the prescription drugs might have. Like we said before, the flavors could have a strong, chemical after taste. Others might be drawn back for the price of 500mg CBD for $59.99. Moreover, the earthy flavor of White Koi CBD might put off some. But, you have the option to mix it to food or drinks. Spending a few extra bucks to take our vaping experience to the next level is worth it. Koi CBD really delivers the goods. Reading customer reviews from their website is eye-opening. Even on the flavors that we didn’t like, there are some high ratings. Preference is really the key in finding suitable flavors in vaping. Also, the health effects of CBD oil are provided. Koi CBD products, which are lab tested, are worth trying. The big question is: Do you think Koi CBD deserves to be in our list for best CBD tinctures? We want to hear from you!